Her decades of work advocating for worker rights and human rights saw Cheryl Stadnichuk recognized with one of three 2019 Global Citizen Awards, presented by the Sask. Council for International Co-operation. Cheryl Stadnichuk is a citizen of Regina, but she's always considered herself a citizen of the world. Her decades of work advocating for worker and human rights saw Stadnichuk recognized with one of three 2019 Global Citizen Awards, presented by the Sask. Council for International Co-operation, at a Saturday gala. "In the union movement, we say that an injury to one is an injury to all. And that is really what I believe, and that's what gives me the commitment to do work in Canada but also globally," Stadnichuk told CBC Radio's Saskatchewan Weekend. 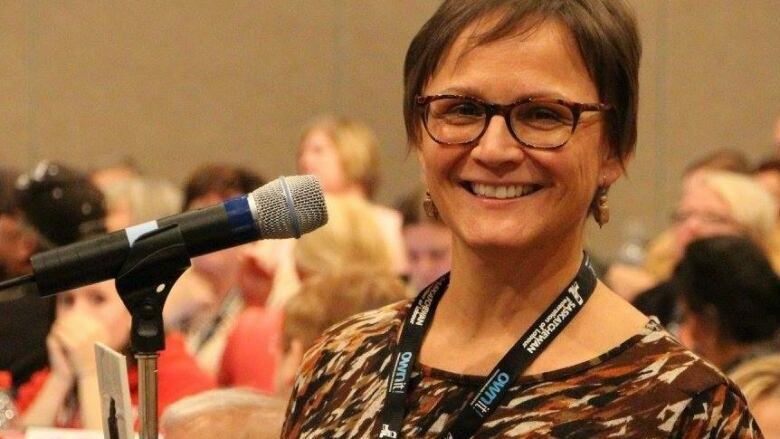 Stadnichuk is a researcher for CUPE Saskatchewan, and has been acting in an advisory role for their Global Justice Committee for most of the last 15 years. She's worked alongside women in countries like Nicaragua and Colombia, fighting for rights even in the face of death threats and violence around them. "Their courage is amazing. I can not imagine working in those kinds of conditions. And they keep going," she said. It's that resiliency in the face of obstacles, she said, that gives her hope in the fight against injustice. Whether it's the thousands of Bangladeshi women striking to defend rights, or women in the United States marching on Washington, she says her work is summed up by the Spanish word basta — which means "enough." "They're saying 'Basta, that's enough of violence against women.'" Two other women were honoured with Global Citizen Awards at Saturday's ceremony, including high school teacher Kyla Wendell McIntyre and long-time Multicultural Council of Saskatchewan executive director Rhonda Rosenberg. The ceremony in Regina kicks off International Development Week, which runs from Feb. 4 to 10.